I LOVE that gourd house!!! The area looks so pretty and inviting. What a wonderful addition to your retirement portfolio...I am sure the new tenants will love it!!! 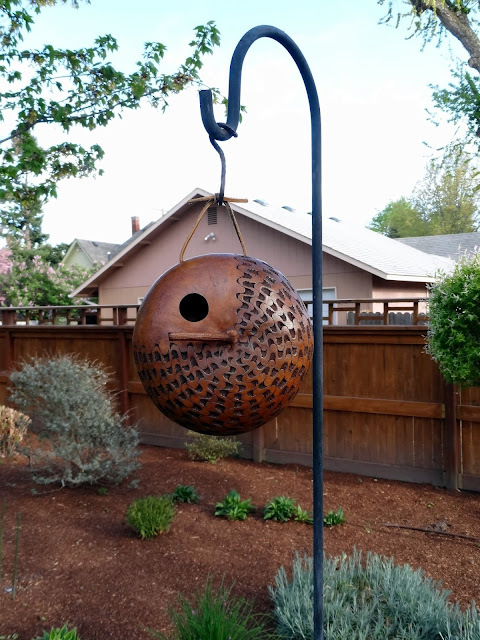 The gourd birdhouse is gorgeous! What an elegant birdhouse and it looks so lovely in your gorgeous gardens. Dining outside, how nice and I can't wait for the temps to rise so that can be done here! If that birdhouse has a sewing machine in it......I'll move in tomorrow! What a beautiful view your new little tenants are going to enjoy. I can't wait to hear about your new tenants! The gourd looks lovely in your yard. Sasha has some special friends indeed. Your yard is so perfectly manicured & that Gourd Birdhouse is just Wonderful !!!!! I was wondering why most of the birds that were in our back forty were packing their bags this afternoon. I noticed that are now on their way out west to check out that spiffy new gourdhouse. They told me to tell you that they'd be there in about a week. Be prepared! Haven't I seen your yard in Sunset magazine? It's beautiful and the perfect home for your gorgeous birdhouse!! 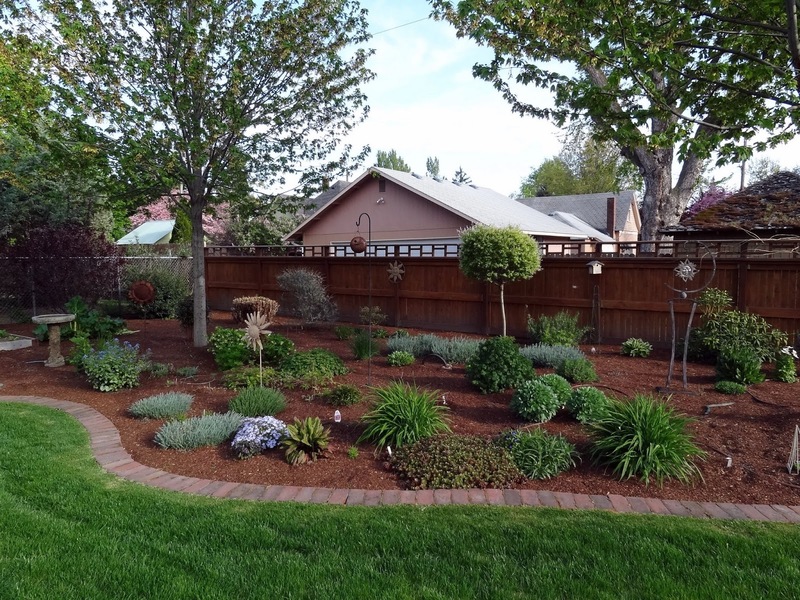 Your garden looks almost manicured! The bird house is beautiful, I hope you will get a nice couple there. Oh, I just love that gourd birdhouse--it is really gorgeous! Hope your bounty of plants and blooms and berries draws some boarders soon :) Sasha is so cute! Your yard is so beautiful and that bird house is so unusual and so beautiful!! Sasha is so pretty and looks like she is adjusting and right at home. Hugs!! Your yard is so inviting that I'm sure you're going to have residents soon. Can't wait to see more pictures. Sasha is adorable. Isn't it unreal how much those little felines can steal our hearts? I am so jealous, I have weeds up to my knees. Your yard is beautiful. What a fabulous bird house- so unusual and beautiful! I wonder who will take it for Spring? Can't wait to find out. What a great yard to enjoy dining out in... and with soon to be guests that chirp! 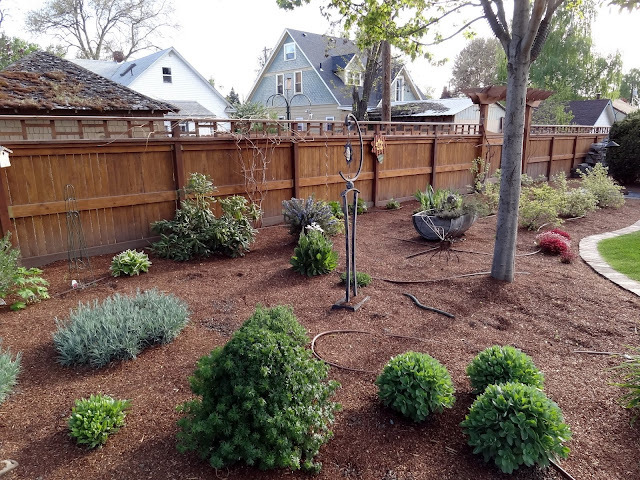 your garden space is pristine! Yes, you will have to share who your new bird neighbors turn out to be. I'm loving your beautiful yard and gourd house. How fun! It's the small things in life that really make us smile. Enjoy! !